ANEPROMA offers different services that allow to evaluate and verify the quality of the treatments of companies and users of treated wood. 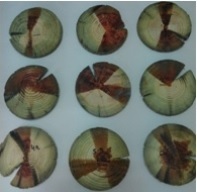 In this way, companies which carry out treatments or who buy treated wood can evaluate adequate treatment received according to the current legislation at the level of penetration test according to JOINS IN 351 and retention for each of the classes of use according to JOINS IN 335, as well as, evaluation and determination of wood species with respect to the product that you want to test. For more information please contact ANEPROMA at the aneproma@aneproma.es email address or phone +34 91 386 98 66.